Out of every topic that a fish keeper should be aware of, perhaps none is more important than the nitrogen cycle. The detoxification and removal of the nitrogenous waste is vital to the health of your fish and the success of your aquarium. The most common problem a new aquarist faces is adding too many fish too quickly. Until your aquarium has had a chance to complete its cycle, you should avoid adding too many (or any, depending on your personal philosophy) fish to your tank. But what is the cycle, where does this waste come from, and how do you handle it? Aquariums are closed systems. This means that every time you feed your fish, the nutrients in that food are going to stay in the aquarium until you physically remove them. They may undergo reactions to change their form, but very little of what you put into the aquarium will be able to leave it without your help. While you obviously have to continue to feed your fish, the tradeoff is that the waste your fish produces is toxic and has to be dealt with. Most people won't have the option or resources of setting up their tank to continually circulate new, clean water into it, so we have to find other solutions. And that's where the cycle comes into play. When looking at the closed nature of aquariums, the nitrogen cycle (often just called the cycle) is the biggest consideration. Put shortly, the cycle is the process by which nitrogenous waste is detoxified and eventually removed from the aquarium. The primary nitrogen source to be concerned about is ammonia (or ammonium, depending on the pH of the aquarium). Over time, this ammonia is converted into nitrite and then eventually nitrate. Ammonia and nitrite are both highly toxic to the fish in your aquarium. Nitrate is relatively harmless until it builds up to very high levels. Virtually anything organic in an aquarium will release ammonia. Whenever you feed your fish, any uneaten food will rot and release ammonia. As your fish digest food, they release waste in the form of ammonia. If you have plants, any leaves that die and decompose become sources of ammonia. Any fish that dies and is not promptly removed releases ammonia. Ammonia is highly toxic to fish. Even relatively low concentrations of ammonia can damage a number of different cells and tissues in fish (particularly their gills), impair their growth, make them more susceptible to illness, and eventually kill the fish living in your aquarium. Fortunately, nature has developed a way to eliminate ammonia in the form of nitrifying bacteria, generally referred to in the aquarium hobby as beneficial bacteria. Where Does Your Beneficial Bacteria Live? As we'll see, the beneficial bacteria that colonize your aquarium play a vital role in ensuring the health of your fish. But where in the tank do they live? On every surface in your aquarium. From the glass sides of your tank to the substrate to the plants and decorations you choose, they are everywhere. The tank by itself, even if it's heavily decorated, likely doesn't have enough surface area to support a large enough colony of bacteria to detoxify your tank. Additionally, the bacteria can only convert what they come into contact with, so it's going to take a long time for ammonia in the middle of the tank to come into contact with any beneficial bacteria. This is where filters come in. Regardless of what filtration method you use, whether it's a hang on back filter, sponge filter, sump, canister, or something else, there are a couple of different roles the filter will play in helping out the beneficial bacteria colonies. The first is that the filtration media, typically some sort of sponge or other synthetic media, is going to have an extraordinarily large amount of surface area for the bacteria to colonize, increasing the total amount of bacteria in your tank. Additionally, all filters work by drawing water through them. Provided the pump is strong enough for your tank, this circulation will ensure that all of the water in your tank will come into contact with the bacteria colonies in your filter media, typically at least several times per hour. When you fill up an aquarium and introduce some sort of ammonia to the water, colonies of these beneficial bacteria begin to grow and develop. These colonies will use ammonia as a food source, converting it into nitrites. While it can take a while for the colonies to grow to a sufficient size, eventually (given enough surface area to colonize on) they will grow to the point that they can remove a steady supply of ammonia as quickly as it can be produced. There are actually two different forms that ammonia can come in: ammonia (NH3) and ammonium (NH4+). Of the two forms, ammonia is much more toxic than the relatively non-toxic ammonium and is the molecule that will most likely damage or kill our fish. Ammonia and ammonium readily convert from one form to the other, meaning that you will likely never have only one or the other. The exact proportion of ammonia to ammonium that will be present is largely determined by the pH in your aquarium. The hydrogen ions in acidic water will bind to ammonia (NH3) to form ammonium (NH4+). Thus, the higher your pH the more ammonia you have while lower pH conditions will have more ammonium. Below a pH of about 6.0, most or all of the ammonia will become ammonium. While it's good for your fish that ammonium is relatively harmless, the problem is that your beneficial bacteria is unable to consume it. Thus, it's going to continue to build up in your aquarium. The problem is going to arise if you perform a water change or add something to your aquarium that raises the pH of the water. The built up ammonium will convert back to ammonia, and without a healthy, thriving beneficial bacteria colony you're going to quickly end up with dangerous levels of ammonia. As the first colonies of beneficial bacteria begin growing and using ammonia, they release nitrite (NO2-) into the aquarium. Unfortunately, nitrite is almost as toxic as ammonia. Nitrite is easily taken in by fish, where it reacts with the hemoglobin in their blood. When this happens, it reduces the ability of the blood to carry oxygen. At low levels, nitrite will stunt the fish's growth. At high enough levels, the fish's blood is not able to carry enough oxygen for its cells to survive, resulting in massive tissue death and eventually the death of the fish. However, like ammonia, more colonies of bacteria will develop that will consume these nitrites. As these bacteria consume nitrite, it is then converted into nitrate. While it's not completely harmless, Nitrate (NO3-) is far less toxic than either ammonia or nitrite. Nitrate can cause problems by inhibiting the use of certain substances (such as vitamins), stunting fish growth, and generally increasing stress in fish (which in turn suppresses their immune systems and leaves them more vulnerable to disease). Fortunately, though, many fish can handle relatively high levels of nitrates with only minimal harm. The problem with nitrates is that while beneficial bacteria can quickly and readily convert both ammonia and nitrite, nitrate conversion doesn't really happen in freshwater aquariums. A small amount of nitrite will be converted to nitrogen gas, but it's done slowly enough to not be particularly meaningful. This results in nitrates continually rising unless the aquarist takes some special effort to remove it. The most common method for reducing the buildup of nitrates in the aquarium is the standard water change. By performing partial water changes, you can instantly remove a portion of the nitrates that has built up. Water changes also have the added benefit of eliminating other pollutants that may build up as well as replenishing minerals and other necessary substances. In planted aquariums, nitrate will be used as a primary food source for the plants. Depending on the amount of plants that you have in your tank, they may even completely eliminate all of the nitrates being produced in the aquarium. However, this doesn't eliminate the need for water changes, as there are more benefits than just nitrate removal. There are certain types of anaerobic bacteria, particularly marine species, that can convert nitrate into nitrogen gas, which is then released from the water into the atmosphere. While there's not a particularly effective method of achieving this in freshwater tanks, it's vital for success with marine fish that are much more sensitive to nitrates. With an adequate amount of live rock you can grow colonies large enough to convert most or all of the nitrate that will be produced. While there are methods to remove nitrates that have built up in an aquarium, it is far better to avoid having them build up in the first place. Don't overstock your aquarium. The more fish you have, the more nitrogenous waste will be produced. If you overfeed your fish, you're going to end up with more nitrate building up in your aquarium. Carefully monitor the health of your aquarium's inhabitants so you don't end up with any fish dying and decomposing, releasing large amounts of ammonia (and ultimately nitrate) into the aquarium. Even if you have a strong maintenance routine that can keep up with removing the nitrate being produced, it's better to stock and feed a little bit lighter in order to give some buffer room in the case of an emergency. 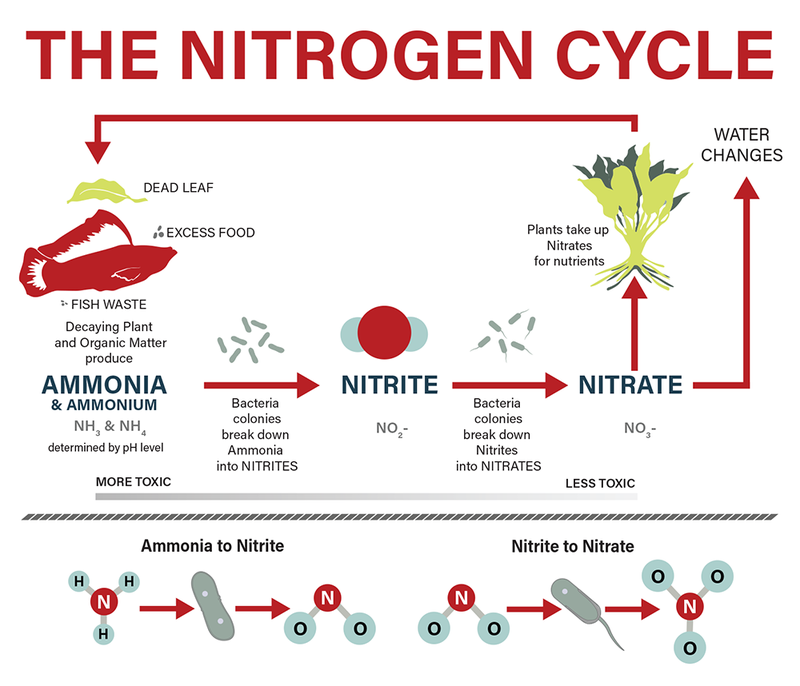 Knowing the biological processes involved in the nitrogen cycle doesn't do much good if you can't apply that knowledge to setting up your aquarium and don't have a way to know how your cycle is progressing. Monitoring and tracking the progress of your cycle will let you know when it is safe to add fish. The only way to track the progress of the cycle is to test the water and measure how much ammonia, nitrite, and nitrate are present. Generally speaking, there are two types of test kits available: those that use paper strips and those that use drops. Of the two, test strips are often easier to use. You simply dip the strip into the water, wait for the strip to change colors, and then compare those colors to the guide. The problem with test strips is that they are often less reliable and are prone to giving false readings. Test kits that use drops are typically more accurate and reliable than test strips, but require a bit more care in using. You must add a specific amount of aquarium water to a tube or vial, add a certain number of drops to the water, and compare the color of the water to the guide. There is room for user error if you use the wrong amount of water or drops. Certain test kits must be shaken well before using and may require a (sometimes substantial) wait between adding drops and the chemical reactions changing the water to the correct color. But if you follow the directions properly, you will get much better results. When you test your water, you can keep a log and track exactly where in the cycle you are. In general terms, the first thing you will see is a rise in the ammonia levels. Eventually, the ammonia level will start to drop and the nitrite will start to rise. Some time later, the nitrite will fall again and nitrate will rise. When both ammonia and nitrite have reached zero, you know that the tank is cycled. How high the ammonia and nitrite levels will reach depends on how much ammonia is being introduced and how large your initial colony of beneficial bacteria is. The total length of time that it takes for the cycle to complete can be highly variable, ranging anywhere from a few days to a few months. The larger the starter colony of beneficial bacteria, the faster the cycle will happen. Factors such as temperature and water chemistry can influence the speed of the cycle. How much ammonia is present can also affect the speed, with too much ammonia stalling or stopping the cycle process entirely. On average, the beneficial bacteria colony size will be able to roughly double each day. 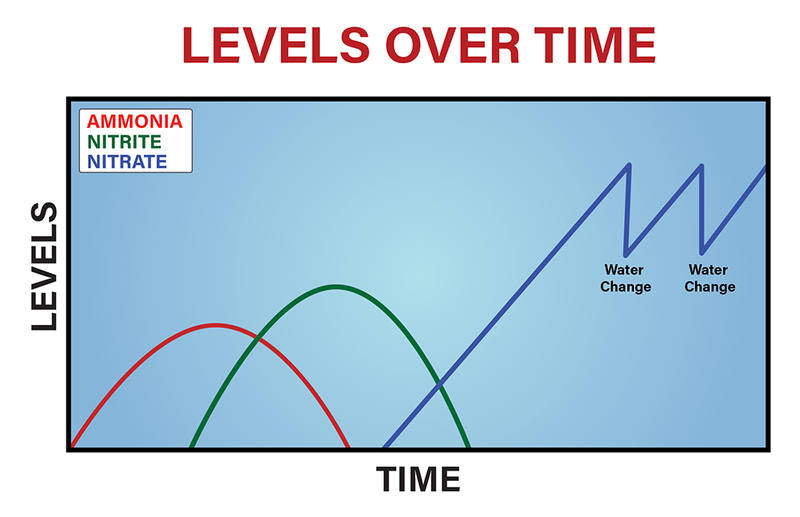 Once your tank is fully cycled, if you lose half of your bacteria colony (for example, by replacing filtration media) or double the amount of ammonia being introduced to your aquarium (for example by adding new fish), equilibrium should be reached again in about a day. The traditional method of cycling involves adding one or two small, hardy fish to the aquarium to start producing ammonia. Between feeding the fish and the fish's normal waste production, ammonia gets introduced and beneficial bacteria start to grow. Fish such as goldfish, danios, barbs, and damsels have been the most common options for cycling a new aquarium because they are hardy enough to withstand many of the toxic effects of the nitrogenous waste. Many people, though, have shifted away from adding live fish to start the cycle. Even hardy fish that are very lightly stocked will be exposed to some amount of ammonia and nitrite and many people will argue that you shouldn't expose them to these harmful chemicals at all. It is also very easy to add too many fish to the un-cycled aquarium to begin with, creating dangerous conditions for your fish and potentially causing many unnecessary problems for both the short and long term. If you are going to cycle with fish, make sure to only add one or two fish at a time, allowing the beneficial bacteria colonies to develop until the tank is fully cycled before adding more fish. Watch your ammonia and nitrite levels carefully and perform water changes if they start rising too high. Once you have completed the initial cycle, continue to only add small numbers of fish each time so that the bacteria can keep up with the increasing bioload without ever having too much ammonia build up. More and more people are choosing to use methods to cycle their aquarium that don't involve risking the health of any fish. The bottom line is that in order to get a cycle going, you have to introduce a source of ammonia. There are a few different sources you can choose. Some people will start with some sort of organic matter. You can add fish food to the aquarium, allowing it to decompose and release ammonia. Some people will use an uncooked shrimp in the same way. The downside of this method is that it can take longer (as you have to wait for the decomposition to happen) and there is little to no control over how much ammonia you are introducing to the aquarium. A better method is to use pure ammonia that can be found as a cleaning solution. You want to be careful to choose a solution that contains only ammonia and water. Avoid any that are supplemented with additional chemicals or fragrances. When using ammonia, start with a small amount (just a few drops) and use your test kit to measure how much is being added. Depending on how large of a bacteria colony you want, add enough ammonia to bring the concentration between 2 and 5 parts per million. 2ppm will be sufficient for a somewhat lightly stocked aquarium, while 5ppm should allow you to fully stock it all at once. Once you've learned how much to add to bring the concentration of ammonia where you want it, you will need to test your aquarium regularly to monitor the progress of your cycle. When the ammonia begins to fall and nitrite begins to rise, keep adding ammonia daily to replenish the desired concentration. Continue this process until you can add ammonia and have both the ammonia and nitrite levels return to zero within a day. When your bacteria colony is strong enough to accomplish this, you are ready to add fish. Perform a large enough water change to bring your nitrates back down. Congratulations, your aquarium is ready. As with many parts of fishkeeping, success largely comes down to patience. However, many people don't want to wait, so a number of products and techniques have been developed that are reported to speed up the cycle process. If you want the absolute fastest way to get a new aquarium cycled, the best way is to introduce a sizeable beneficial bacteria colony from an already established aquarium. The most common method would be to place a filter pad that has been in an established aquarium into your own filter. If the established tank uses an undergravel filter, you can take a cup or two of the gravel from that tank, place it in a mesh bag, and add it to your filter. These methods have the potential to instantly cycle your tank, but they also run the risk of accidentally introducing diseases into your aquarium. There are a number of commercially bottled products that claim to introduce enough bacteria to significantly increase the speed of the cycle. People have had very mixed experiences with these products. While they likely were all bottled with good amount of beneficial bacteria in them, additional factors such as how long they have been bottled and what sort of temperatures they have been exposed to can affect the health of the original colonies, potentially even killing all of the bacteria in the bottle. There is no way to know how healthy the bacteria contained truly is. Aside from these additives, you can try to set up your aquarium to encourage faster growth of the beneficial bacteria colonies. Try to keep the temperature of your aquarium between 80 and 85 degrees and the pH around 7.5. Nitrifying bacteria growth will slow down or stop in acidic conditions or when the pH is above around 8.0. Additionally, using an air pump to increase the amount of dissolved oxygen can also help speed up their growth.